In this study, in situ control growth of bismuth nanoparticles (Bi0 NPs) was demonstrated in bismuth-based glass dielectrics under an electron beam (EB) irradiation at room temperature. The effects of EB irradiation were investigated in situ using transmission electron microscopy (TEM), selected-area electron diffraction and high-resolution transmission electron microscopy. 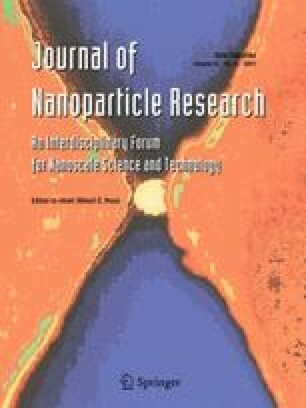 The EB irradiation for 2–8 min enhanced the construction of bismuth nanoparticles with a rhombohedral structure and diameter of 4–9 nm. The average particle size was found to increase with the irradiation time. Bismuth metal has a melting point of 271 °C and this low melting temperature makes easy the progress of energy induced structural changes during in situ TEM observations. This is a very useful technique in nano-patterning for integrated optics and other applications. SPS express his sincere gratitude for the financial support of the Council of Scientific and Industrial Research (CSIR), New Delhi in the form of CSIR-SRF under sanction number 31/15(78)/2010-EMR-I. The authors thank Director of the institute for his kind permission to publish this article. They also thankfully acknowledge the Electron Microscope Division of this institute for recording the TEM, HRTEM, and SAED images.